On Saturday I spent my time at the Dallas Museum of Art for two specific events. 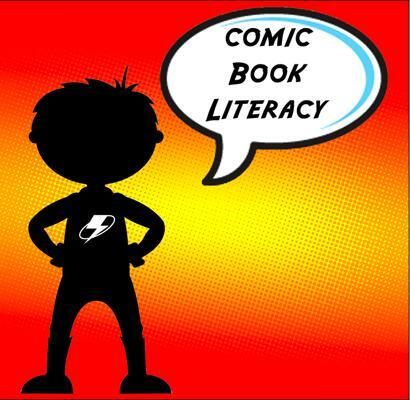 The daytime event was the Dallas premiere of Comic Book Literacy, an award-winning documentary by North Texas filmmaker Todd Kent showcasing the use of the comic book medium for educational purposes. The night time event was an amazing experience as award-winning and New York Times Best-selling author Joyce Carol Oates spoke to a packed house. Both events took place at the Horchow Auditorium and I’d like to share with you the doubleheader at the DMA. Lets start out our Doubleheader with the fun Q & A panel that followed the screening of Comic Book Literacy. 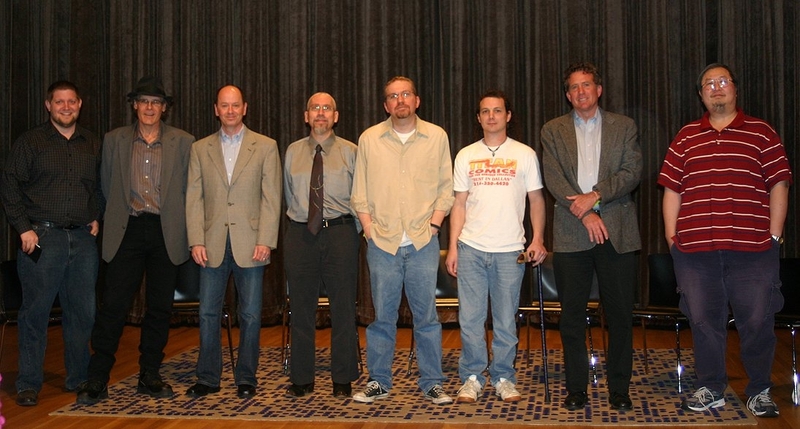 (from left to right) Scott Hinze (host of Fanboy Radio), James O’Barr (creator, The Crow), Terry Moore (Strangers in Paradise, Echo), comic book historian Weldon Adams, Todd Kent (me) director of Comic Book Literacy, Ethan Nahté (writer/filmmaker), James Disco (Echoes of the Lost Boys of Sudan) and Ben Dunn (Ninja High School). Most of the conversation floated between the basic appeals of Comic Books to people. A really intriguing question was posed by a librarian who was asking what about the impact Comics can have on children with speech and mental disabilities like Aspergers. Author Terry Moore gives an insightful response to this great question. Wheldon Adams brings up how Richie Rich is RETURNING to comic books, and the little kid inside me went a little giddy!! The panel gave some great suggestions for comics to get into for young kids. Speakers in order are Director Todd Kent, James O’Barr, James Disco, Ethan Nahte, and Terry Moore. Weldon Adams, Ben Dunn and Scott expand on the suggestions. To find out more info on the documentary please visit their site. Under the DMA’s Arts and Letters Live series their is a section called the Distinguished Writers. In this section, Award-winning authors read from and discuss their work, respond to questions, and sign books. On Saturday Night one of the finest short fiction writers of our time, and possibly all-time, Joyce Carol Oates captivated a packed audience. Joyce has been hailed as “one of the greatest writers of our time” by the late novelist John Gardner. She has established herself as one of the most renowned contemporary writers of the short story, winning more O. Henry Prizes (big ups to William Sydney Porter, sorry I’m a big fan and I went to O.Henry Elementary School so THERE!) than any other author (!). She is the recipient of numerous Pushcart Prizes, and her work has appeared in many of the Best American Short Stories anthologies. Her story “Where Are You Going, Where Have You Been?” was included in Best American Short Stories of the Century. But Short fiction isn’t all that Joyce is well-known for. She is the author of over fifty novels, including the New York Times bestsellers We Were the Mulvaneys, The Falls, and The Gravedigger’s Daughter as well as them (winner of the National Book Award), Blonde, and Black Water (both finalists for the Pulitzer Prize). The creative writing professor at Princeton University was highlighting her latest book, A Widow’s Story. The book is a poignant, intimate memoir—a work unlike anything she’s written before—about the unexpected death of her husband of forty-six years and its wrenching, surprising aftermath. Enlivened by the piercing vision, acute perception, and mordant humor that are the hallmarks of her work, this moving tale of life and death, love and grief, offers a candid, never-before-glimpsed view of this acclaimed author and fiercely private woman. 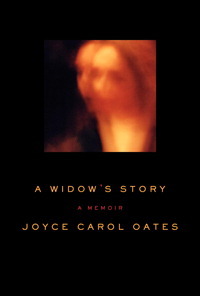 Joyce spoke for just over an hour and half, non-stop by the way, in which she talked about her storied career and of course the Memoir that is such a tragic personal story. She began the evening discussing how much teaching has meant in her life. Joyce began her readings with a small poem dedicated to her long time pen pal, John Updike. Before jumping into the poem though, Joyce talked about the many similarities with her recently passed away friend, and well something funny happened! 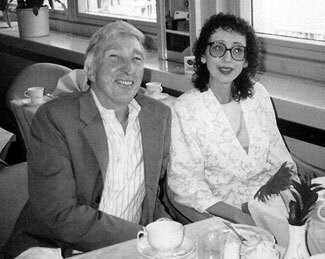 JCO and John Updike at the Swedish Book Fair, Gothenburg, Sweden, 1987. Photo by Raymond Smith. Here is the poem, OLD CRAYOLA, for her friend John Updike. Joyce talked about life on the farm and gave a special shout out to our city!!! Joyce talked about one of her earliest writing influences, and this author just may shock you! The first book thought that really intrigued a young Joyce was a pretty well-known tale. Joyce would go on to read a prose poem that really paints a unique picture of the impact of money on us all. The third poem she’d read, before jumping into her memoir, is one that is dedicated to Billy Collins. March 31, 2005. Photo by PMc Blog • “subtitles” by Anita Sarko. Joyce was kind enough to share with us segments from her Memoir and it was quite difficult to listen to the tragic events around her husband’s death. I’d like to only share with you one particular passage she read that is just so moving and the epitome of grief. 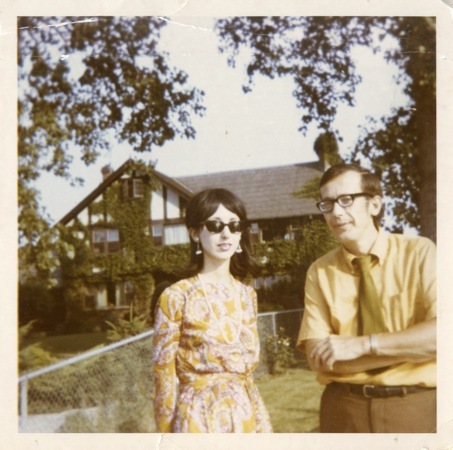 Joyce Carol Oates and Raymond Smith at their home in Windsor, Ontario, in 1970. The Q & A session that followed Joyce’s gracious readings was entertaining and extremely enlightening. The first question was about her writing style. The next questions dealt with dreams and Joyce talked about great ways to enhance your writing. Joyce then explained the difference between novel and short story writing. This clip is a bit long, but FASCINATING. Joyce ended the evening by talking about the way to write about men. Just such an amazing Saturday spent at the Dallas Museum of Art. I hope you’ve enjoyed it. 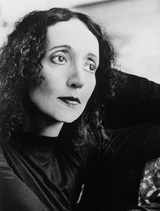 Have been reading Joyce Carol Oates since 1971, including under her pseudonym, Rosamond Smith. Ms Oates and I have become Senior Citizens together. A highlight of my reader’s life is to have heard her speak at Wilkes College (Wilkes University now), Wilkes-Barre, PA, some 20+ years ago- I still have the program guide & keep it inside the cover of Wonderland (1971), unable to ask her to autograph it due to the crowd. Now my grown-up daughter & I have our own two-person JCO Book Club, sharing our impressions and watching for each new book or New Yorker magazine excerpt. I am one third through A Widow’s Story and it is almost too personal for a mere fan such as myself, that I have no right to witness the effect of her loss; as if looking through Mrs. Smith’s window at home into her “nest” where she privately grieved. She is a remarkable woman and brilliant writer, and her students are so fortunate. I confess I am jealous of them.